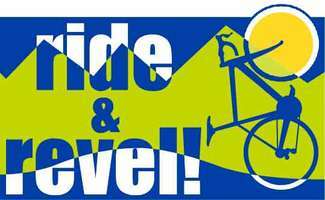 The third annual Ride & Revel! cycling event begins in Lincoln Park in historic downtown Greeley, Colorado. Ride & Revel! is a fundraising event presented by local non-profit Senior Resource Services, in support of their 60+Ride program. The event features three recreational road courses, 20-Mile, 40-Mile and 55-Mile, and two new gravel routes to be posted soon. Volunteers are needed to help throughout the event, from registration to course marshals! We welcome individuals and groups, and look forward to seeing you there as we come together for a fun day in support of Weld County's aging population! Every volunteer who assists during the Ride&Revel! event will receive an Official Volunteer T-shirt and cooling towel. Breakfast food and beverages will be available for all volunteers 6:30 am- 10:00 am. The Revel! event begins at 10:30 Am, and volunteers are invited to join the fun! Each volunteer will be provided one brunch ticket and food will be available for purchase by family members. Volunteers who are 21 and older will be provided one ticket for Lemon Wheel IPA craft beer, and additional beer may be purchased. Non-alcoholic beverages will also be available. There will also be live bluegrass music! It will be a really fun event for a very important cause, older adult transportation. Like us on Facebook @rideandrevel and share with your friends! Event Set up. Volunteers will arrive at Lincoln Park early to assist with set up. Cheer for our cyclists as they cross the finish line! Perfect for groups, including scouts and teams! Volunteers can be any age, but must have adult supervision (5 to 1 ratio). Hand out shirts to cyclists. Assist the cyclists with checking in. What goes up, must come down. Join us Saturday afternoon to help us break down and pack up supplies and equipment. Perfect for groups, including scouts and teams! Volunteers can be any age, but must have adult supervision (5 to 1 ratio). Volunteers can sign up for the first and second shift. 15 teams of two will be assigned a specific location along the course. Volunteers must be 16 or older and have a valid driver's license. Detailed information will be emailed to you. 4 teams of two will be assigned a specific location along the course. Volunteers must be 16 or older and have a valid driver's license. Detailed information will be emailed to you. Volunteer drivers provide support to cyclists by driving the route to help cyclists when needed. A vehicle will be provided. Assist volunteers when they check in to ensure that they are supported and that they are where they need to be, when they need to be there. Assist volunteers when they check out to ensure they return Course Marshal items.